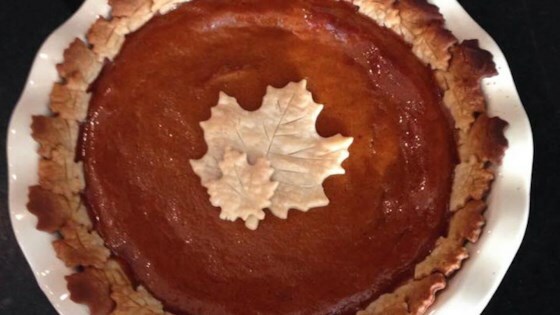 "This is my husband's favorite pumpkin pie. It's less spicy than traditional pumpkin pies so you can really taste the pumpkin flavor!" In a large bowl, combine pumpkin, evaporated milk, eggs, sugar, flour, salt vanilla and cinnamon. Pour filling into pie shell. Bake for 20 minutes at 450 degrees F (230 degrees C) then turn oven temperature down to 350 degrees F (175 degrees C) and continue baking 40 more minutes or until a knife inserted in center comes out clean. Cool completely on a wire rack before serving. I made a few changes to this recipes I double the vanilla extract. I substitute cream for the evaporated milk. Excellent pumpkin pie recipe. Even for a non-pumpkin pie lover.